This program is so easy to take advantage of. 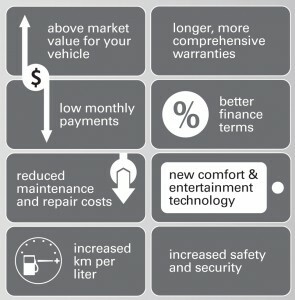 The next time you are visiting Mercedes- Benz Brampton for service, ask your advisor about the Vehicle Upgrade Program. It is simple, easy and has no obligations! Or, you can simply fill out the form to the right and ask for your exchange. EPA ratings are a useful tool for comparing the fuel economies of different vehicles but may not accurately predict the average MPG you will get. Based on average of 15k miles per year. Cost of maintenance and repairs, on average. AAA incorporates standardized criteria designed to model the average member’s use of a vehicle for personal transportation over five years and 75,000 miles of ownership.